Puck Watch: Canucks' Luongo "second best goaltender on the ice"
Canucks' Luongo "second best goaltender on the ice"
7uongo, Reboundo Luongo, you name it, he's heard it this season. After winning a gold medal for Team Canada, some detractors changed their minds and felt that Roberto Luongo could win 'the big game', but 10 games into another post-season, the Canucks and their netminder are floundering. In their second round series against Chicago, the poor statistics are endless. Head Coach Alain Vigneault called Luongo 'the second best goaltender on the ice' tonight when asked about his performance. Luongo has allowed 7 goals again this evening in a 7-4 loss. 4 of those goals were on the powerplay, making it 6 power play goals against in the last two games. Luongo has given up 13 goals in his last 7 periods and seems unable to deal with Dustin Byfuglien, Patrick Kane and Jonathan Toews. Quite simply, Luongo has not been good enough. Blame the referees, blame the penalty kill, blame the defense, but the real problem lies with the Canucks' best player not playing like their leader and best player. The Canucks simply need more from Luongo. 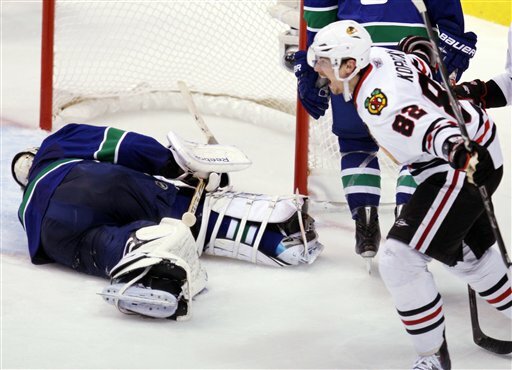 While other teams remaining in the playoffs such as Montreal, Pittsburgh, Boston, and Chicago enjoy solid performances from their goaltender, the Canucks have yet to have their goaltender steal them any games this post-season. Luongo had some timely saves against Los Angeles in Round 1 but was relatively average otherwise. For someone who is touted as arguably the best goaltender in the world, he isn't playing like the best goaltender in the playoffs right now, and not even the best goaltender in the series. The endless stream of rebounds and backbreaking goals in this series is burying the Canucks chances faster than the Hawks have been scoring on the power play. A captain should produce momentum changing plays and lead the team by example. Well, 18 seconds into tonight's game, Luongo forfeited a weak goal. The second goal Luongo failed to fight through a screen, and the third goal he was not alert at all when a lucky bounce went the Hawks way. The fourth and sixth goals were bad rebounds and failed attempts to cover the puck, while the fifth goal was simply a timid Luongo far too deep in his net. Game One aside, it just does not seem like the Vancouver team is capable of keeping the Blackhawks to less than 3-4 goals in a game. They cannot hold a lead, and when they fight back to tie the score, they take a penalty and give up a goal or two to fall behind once again. For Canucks fans, their play has been frustrating and it begins and ends with their goaltender. To make matters worse, Luongo is not demonstrating the composure or courage under fire you might expect from a captain. His frustration in net is evident and his inability to take accountability in post-game interviews is astounding to many fans. How many times has Luongo said he has to play better? How many times in the playoffs has he accepted the blame for the penalty kill or a momentum changing goal? There is very little personal accountability from him and it may soon be too late. While Vigneault might wish he could start Raycroft (who has played well this season) to give Luongo a rest or a wake up call, that obviously will not happen. Luongo is their guy. With a long-term contract and a large pay cheque, starting Raycroft is not even an option in the year's most important game. Therefore, the Canucks chances live and die with Roberto. If Luongo struggles on Sunday and the Canucks season ends, what becomes of his captaincy? Should he forfeit the C to Ryan Kesler ? This article is spot on. Especially the part about the complete lack of accountability that Luongo shows. He is so quick to throw his teammates under the bus, so to speak, which no goaltender should do period, but when you have a captain doing it there is an even bigger problem. I wouldn't make Kesler the captain, don't count the empty net goal he had in round 1 and he is scoreless these playoffs, and has been a major part of the Canucks revolting penalty kill. The whole team has a leadership problem, they just could not settle down and play like they did during the season or even game 1 of this series, and look what happened. They deserve to be where they are, hopefully now everyone realizes what overachievers they were and demand significant changes. I've always stood up for Luongo over the years but I've lost faith this season - and I'm not someone who is quick to jump on our players. He's too emotionally fragile, he lets players get in his head and allows them to throw him off his game. I was happy to hear Alain say that Luongo was the second best goaltender on the ice last night. We needed better from him and once again, the rebounds and bad goals killed us. He didn't give us a chance to win. this article sounds like it's written by an under-developed monkey..